Biotech is the innovative biological toilet paper that saves time, money and the environment. Biotech contains five different types of good microorganisms, which are totally harmless for us and the environment but remove incrustations and smelly substances from the pipes. 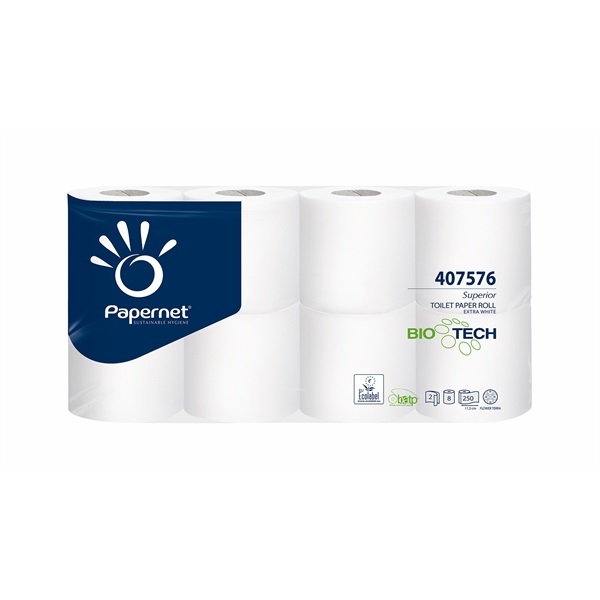 You don’t have to wait long to see results in just four weeks the cleaning action of Biotech toilet paper helps eliminates blockages, nasty odours and other dirt from the pipes. Constant use of Biotech reduces the need for the mechanical cleaning of sewerage systems, hence reducing maintenance costs. Sample studies carried out on tourism/accommodation premises with an average of 100 visitors daily demonstrated that the exclusive use of Biotech radically reduces the need to unblock the sewerage system and makes for some considerable savings – up to 40% as compared to using standard toilet paper. One of our own customer trials clearly demonstrates how effective the product is in large office complexes where plumbing can be an issue call us if you would like to see the results. As well as cleaning pipes, the good microorganisms in Biotech toilet paper contribute to eliminating surfactants emitted by cleaning products, and once the active action is complete, they biodegrade without leaving any residue. Thanks to BATP technology, which forms the basis of the Biotech product, the simple action of throwing toilet paper into the water is transformed into an action of respect for the environment.